All eyes, Irish and otherwise, will be on Navy quarterback Trey Miller as he leads the Mids against Notre Dame in Dublin. 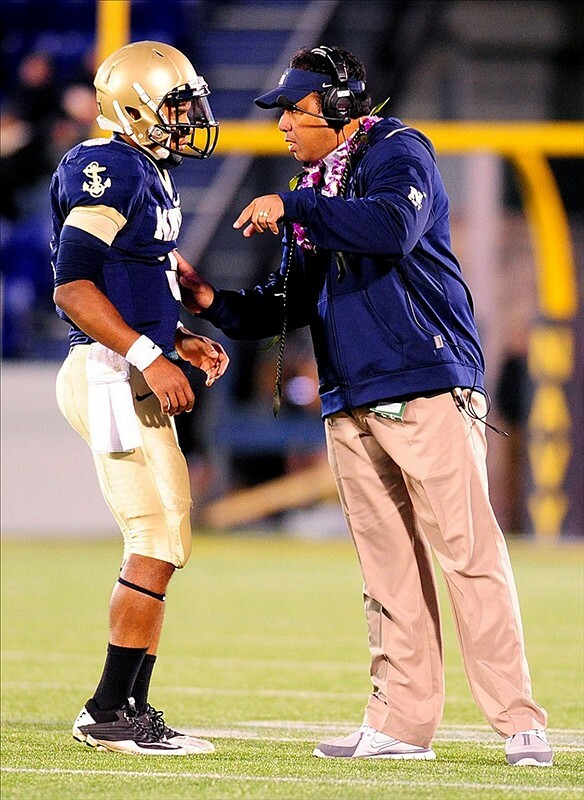 Here, Miller listens to Navy head coach Ken Niumatalolo on the sidelines during last season’s 42-14 home win over Troy. 1. Navy in the news. A big week for the Mids continues as the team prepares to fly to Ireland tomorrow. The season-opening Dublin tilt against Notre Dame has drawn extensive media coverage. Among the highlights: The Washington Times looks at Navy starting quarterback Trey Miller’s growth into a leadership role; CBSSports.com examines the Notre Dame running back situation after Cierre Wood’s suspension; and The Associated Press offers its preview — get that, and all your Navy news, here. 2. Navy on the tube. CBS will carry Saturday’s game for U.S. viewers, with kickoff slated for a little after 9 a.m. Eastern — a bit of breakfast football. But the coverage goes far beyond that. For starters, CBS Sports Network will air a two-hour pregame show beginning at 7 a.m. Eastern (1 a.m. for you folks in Hawaii; more like midnight-snack football) . The CBS TV game feed will be broadcast to 66 countries by ESPN America, according to a Navy release, blanketing much of Europe. The American Forces Network will cover troops everywhere, also airing the CBS feed. ESPN: Both prognosticators put Navy in the Dec. 29 Kraft Fight Hunger Bowl in San Francisco, facing a Pac-12 opponent (UCLA or Cal). They both send Army to the Military Bowl presented by Northrop Grumman, set for Dec. 27 in Washington, D.C., against a Mid-American Conference foe (Marshall or reigning Military Bowl champ Toledo). They both send Air Force home for the holidays. SI.com: Stewart Mandel (a good Twitter follow for college football news. Not this good, but good) agrees with a Navy-Cal contest in San Francisco. He puts Air Force in the Bell Helicopter Armed Forces Bowl that same day in Fort Worth, Texas. He keeps Army home. CBSSports.com: Jerry Palm sends Louisiana-Lafayette to San Francisco to face Navy, predicting the Pac-12 won’t have enough teams to fill the bowl slot. He shuts out both Army and Air Force. Phil Steele’s updated bowl predictions still have all three service academies going bowling. Better news for Army fans: The football guru picks the Black Knights to end Navy’s win streak come December.